On my stats page I get a list of “referrers”–websites that have supposedly sent someone to NME with a link. 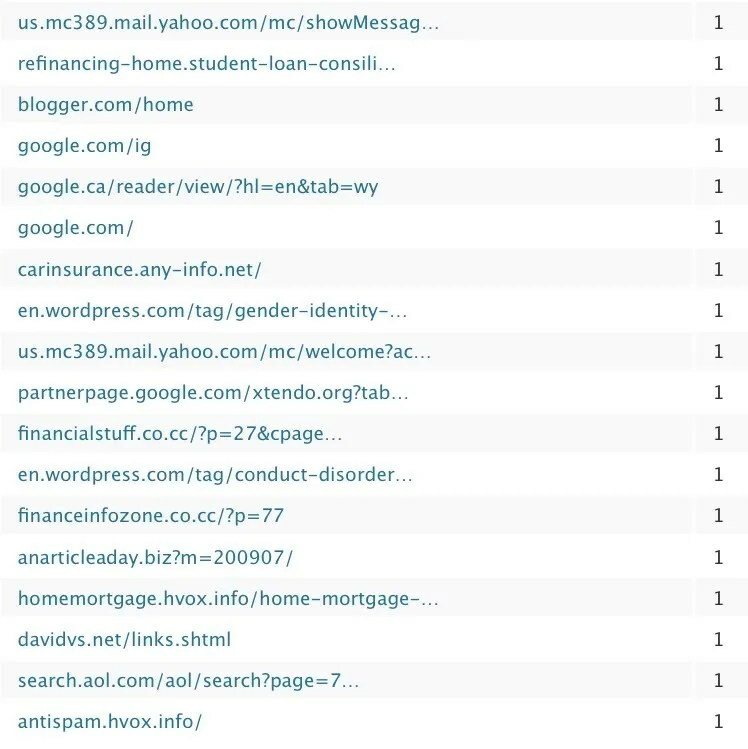 Off an on I get waves of what appears to be a strange kind of spam–websites show up that are clearly not linked or affiliated with me in any way. It’s slightly annoying but more perplexing. I am the only audience here, not my readers, because this stuff is only accessible to me. Does someone actually think that I am going to go buy their stuff because they sent a robot to make it look like a person came to my site from theirs? I guess it’s like email-spam, and they are relying on spamming huge numbers of people to get a few suckers, but is it really worth it to write these spam programs for a few suckers? What it means is someone or even a bot created a link to your content, and someone else used the link to get to your post. This is a good thing for you because it’s a backlink.. However the backlink came to exist, you definitely want it… Anything that brings traffic is good – the more the more traffic you get, the better your blog will do in Google results. You can often visit the referrer to find out if and where the link is on the referring page. Try a few of the more detailed ones to test this – the generic ones like google.com or blogger.com/home just refer to the search engine or the blogsite however. Askimet is really good at protecting your blog from these suckers. Some blogs do automatically publish these, making it low-hanging fruit for spammers. The one mentioning xtendo.org isn’t spam, though. That’s Jill’s site.